HOUSTON (KTRK) -- A man wearing a Houston Police Department jacket and hat robbed a store in South Houston. A surveillance camera captured these images just before midnight on March 11th. 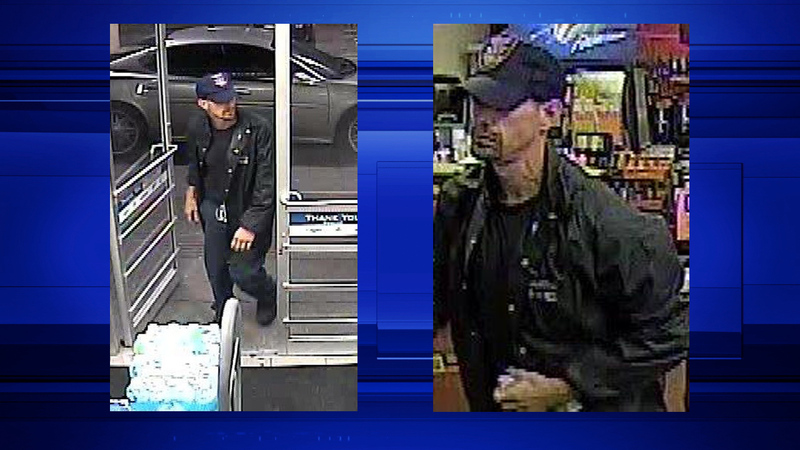 Police say the suspect entered a corner store in the 14000 block of College Avenue. Officers stated that the suspect asked how their day was going, pulled out a handgun from his waistband and demanded money. Police say the victims' gave the suspect the money that was in their registers. The suspect fled the scene in a teal colored Nissan, possibly a Sentra. The suspect is described as a white male. He stands approximately 5 feet 8-10 inches tall. He had a goatee that appeared to be red in color. Crime Stoppers will pay a reward of up to $5,000 for information leading to the charging and/or arrest of the suspect or suspects in this case. Information may be reported by calling 713-222-TIPS (8477) or submitted online at crime-stoppers.org.